For its 500th restaurant, Mang Inasal took its milestone marker to where it all started. The homegrown chain recently opened its newest branch in Iloilo, its 17th restaurant in the city. Jollibee Foods Corporation (JFC) chairman and founder Tony Tan Caktiong, JFC chief executive officer Ernesto Tanmantiong, and JFC country business group head Joseph Tanbuntiong led the ceremonial marker, ribbon-cutting, and ceremonial first bite of their iconic chicken inasal. 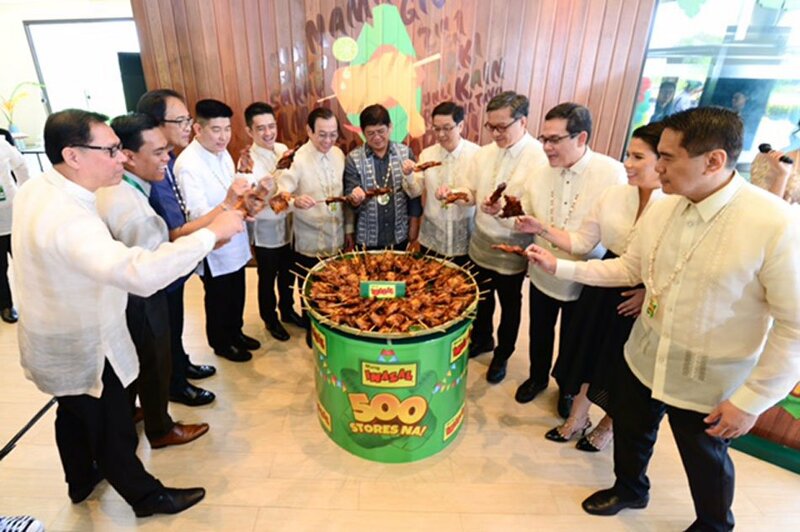 “Mang Inasal is happy to share its milestone of reaching 500 stores with Filipinos who have been with us in our journey in the food service industry,” said Mang Inasal strategic business unit head Jojo Subido. Iloilo city mayor Jose Espinosa III, vice mayor Jeffrey Ganzon, and Mang Inasal founder and Double Dragon Properties Corp. chairman and CEO Edgar Sia II were also present as special guests. Sia was awarded with a banana leaf token to pay tribute to his visionary leadership. Unlike any other branches, Mang Inasal’s “milestone store” displays a fresh and contemporary exterior. The store’s interior is inspired by a provincial home, with its colorful buntings, Pintados-patterned walls, and various murals. Employees, meanwhile, are dressed up in uniforms designed by Rajo Laurel. “The store is designed to have a simple, functional, and commonplace aesthetics,” according to JFC Corporate Global Real Estate’s chief estate officer William Tan Untiong.